Brenna Lovera dribbles on the outside of the box. The senior forward scored two goals against Bowling Green. Brenna Lovera took her time heading back down the field, drifting to the middle of Martin Stadium with 35 minutes left to play in the match. The senior forward had just scored her second goal of the day, and as she headed back, the crowd erupted in one of its loudest celebrations of the day. It’s been a while since Northwestern had a single striker making this much of a difference. 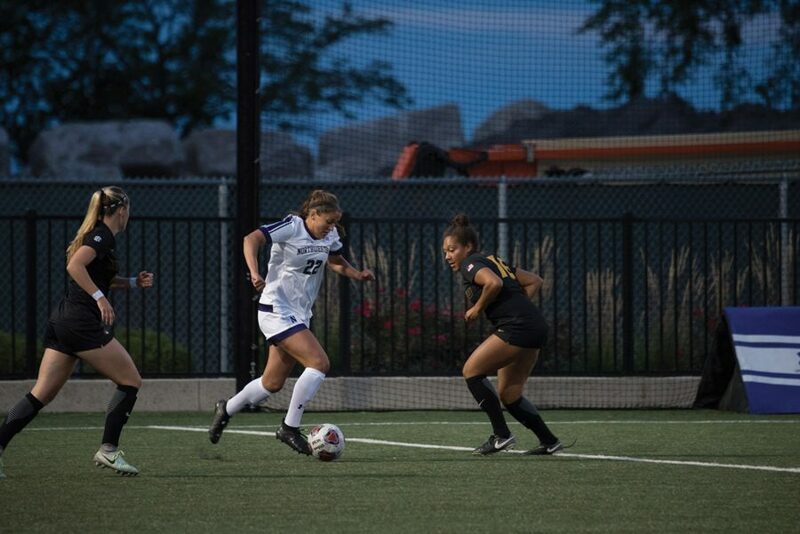 The Wildcats (6-0-1) beat Bowling Green (1-3-1) on Sunday 2-0, three days after Lovera scored the winner in a 1-0 victory over Loyola Marymount (2-4-1). No. 15 NU finished nonconference play unbeaten, and Lovera finished it with as strong a game as she’s had in her career. In the 10th minute Sunday, Lovera headed in a cross from the right side past Falcons’ goalkeeper Kathleen Duwve, and 10 minutes into the second half she blew by two defenders and struck from the back of the goal box. As easy as Lovera has made it look, she’s taken on a completely different role than the one she had last season. In 2017, the offense flowed without her. It relied on crosses from organized set pieces struck by senior midfielder Marisa Viggiano, and a parade of bodies vying for contact near the net. Defenders Kayla Sharples and Hannah Davison, the two tallest position players on the team, were the ones most frequently called upon to score. NU hasn’t scored a single goal off a set piece this season, and Viggiano doesn’t have a single assist after recording eight as a junior. This year, Lovera has created all but one of her goals by herself, heading in ricochets off the crossbar or navigating around defenders like she did in the second half Sunday. Lovera has already scored four times this season, putting her on pace for one of the best scoring seasons in school history. And if the senior continues to average a goal nearly every other game, she’ll finish her career with 23, good for the third highest mark of any player at Northwestern. With the Cats finishing nonconference play with their sixth consecutive shutout, Moynihan is optimistic as the team heads into conference play.